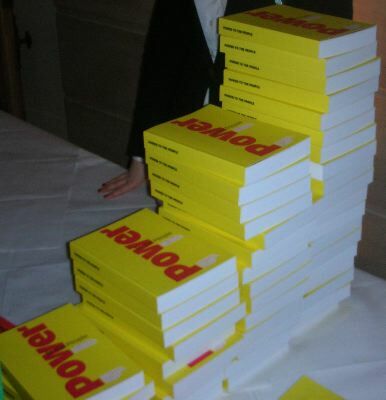 The other day I went to the launch of Power to the People, the independent inquiry into Britain's Democracy, and came away not sure what to make of it. The message in the 300-page report was pretty clear and well reported, as the Make My Vote Count linkdump shows. In essence it was that the current way of doing politics is killing politics - and democracy too. “Politics and government are increasingly in the hands of privileged elites as if democracy has run out of steam. Too often citizens are being evicted from decision-making – rarely asked to get involved and rarely listened to. As a result, they see no point in voting, joining a party or engaging with formal politics." 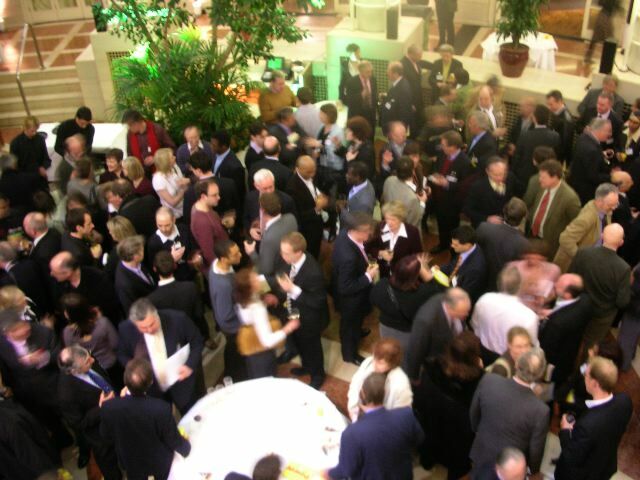 The reception was the usual fine affair - big atrium in Millbank, plenty of free drinks and nibbles - with a splinkling of senior politicians including Gordon Brown, Kenneth Clarke and David Davis. It was also pretty usual in that there were small badges but no hosting, so if you weren't an insider you had to squint at people's chests while deciding whether to risk introducing yourself inadequately to someone Important, or over-enthusiastically to someone who might prove difficult to escape. I'm not sure if there were many People there, but we are all invited to a post-launch conference on March 25. The year-long inquiry, funded by two of the Joseph Rowntree trusts, was very thorough, taking in 1,500 public submissions and running a wide range of surveys and hearings. There seemed general agreement among the people I talked to that the analysis was sound: people are not disengaging because of negative news media, apathy, lack of time or other voter-centric factors. They are cheesed off in large part because participation in political processes doesn't seem to make much difference. As I've written before, that's a problem with lots of local engagement processes too, so I suppose I should have been pleased to find some agreement. It wasn't until I was walking back to the Tube that my underlying uncertainty surfaced as a simple question: how did the inquiry move from it's enormous and thorough process of gathering evidence, to the challenge of coming up with its 30 recommendations... and do these recommendations really address the problem? Page 38 of the report details the evidence-gathering, and says that the Commission then spent six months deliberating and discussing drafts of the report. The recommendations (pdf download) are comprehensive, and emphasise rebalancing power between different elements of the political system, changing voting systems, and strengthening engagement processes. There's lots about the role of the whips, Select Committees, decentralisation, citizenship education, and public hearings. Every local authority should have a "democracy hub". But aren't these just the sort of political procedural mechanisms that people are sceptical about? At the reception there was also a fair representation of civil servants, think tankers and political advisers musing on rebutals, counter-proposals, and yes-buts. My misgivings about the report perhaps stemmed from a subconscious sniff at the rising scent of business as usual. The report argues cogently that it is important that citizens re-engage with the machinery of democracy. It dismisses various views that other types of engagement can be substituted. Fair enough, but I'm not sure that the procedures recommended are very appealing. It was at this point another train of thought took over... and the key question surfaced. Where did the recommendations come from? How did the Commission move from analysis of evidence to recommendation? It took six months.... but how? Was it a matter of the staff and advisers drafting and redrafting, running Commission meetings and away-days? Or were there some procedures by which emerging ideas were tested back with those who submitted evidence? I couldn't see anything in the report about that ... though it may well be in the backup material, and the conference will provide an opportunity to find out more. For what it was worth, I contributed to the Inquiry through an interview and didn't hear about any further possible involvement. Anyway, if it was an entirely internal process it does, for me, raise a question about whether the Commission is walking the talk, practising what it preaches, and so on. Is it really "downloading power" - as it advocates - or is it simply offering JACE - Just Another Consultation Exercise? In JACE the power-holding body consults with various stakeholders and comes back with options or recommendations generated by some black-box process managed by the experts. They then ask people to comment or choose among the recommendations, without offering ways to generate new ones. The whole package is then despatched to some other powers-that-be who may or may not take any notice. In short, the process of analysis, recommendation and delivery is out of the hands of most of the participants. General experience is that nothing happens, and people become further disenchanted. I looked again at the inquiry's recommendations to see if there was just one thing where I could do something to make a difference. Nothing. The whole reform package depends upon the current power-holders changing the way things work. Will they? Do turkeys vote for Christmas? Last year, when first looking at the work of the Commission, it struck me as pretty conventional and top-down. Still, there was a blog, so maybe there would be interaction throughout the process. I checked back today to find "The blog was archived as part of the end of the Inquiry's evidence-gathering phase". Even the archive is off-line. Suspicions confirmed. It was all JACE. I think it’s important to keep in mind two key things about the Power Inquiry. Firstly, it was set up as an independent public inquiry led by a Commission of ten people. Secondly, its aim was to develop concrete recommendations designed to re-engage people with democratic politics or, maybe more accurately, re-engage democratic politics with people. Given that this was its structure and remit, Power inevitably had top-down elements to its process and inevitably made recommendations about how those in power should change our democratic institutions to encourage engagement. There is, of course, a case for a much flatter type of process looking at “everyday democracy” but this would have been a very different animal with different outcomes. I don’t think the existence of one necessarily rules out the existence of the other. Having said that Power was not your bog standard public inquiry which in David’s phrase amounts to “Just Another Consultation Exercise” (JACE). Here are just three points as to why this is the case. 1. The Commission deliberately did not include the usual suspects – no MPs, judges, academics. It was deliberately made-up of independently-minded people from a variety of backgrounds some with party allegiances, some with none. 2. The Inquiry was always designed to be about engaging with as many people as possible rather than just experts and interested parties. Hence we launched a series of initiatives to encourage evidence from people who would not normally consider submitting to a public inquiry. This is why we ended-up with over 1,500 submissions from members of the public. 3. The ideas developed by the Commission during its deliberative phase were “tested” through a randomly-selected citizens panel based in Newcastle-Gateshead and our ‘Democracy Dinners’ project. Parts of the Commission’s conclusions were discussed with some people who took part in the earlier evidence-gathering phase but it was clear that revealing the whole report for consultation prior to the official launch date would have severely weakened its impact. This was undoubtedly the right approach, given the great media interest and the way the report has kick-started a national debate about democratic change. This is why we have organised a free conference for May to allow the wider public debate on the report which was not possible in the later stages of the inquiry. The most important factor though - and this is why I think David’s characterisation of Power as JACE is unfair - is that most consultations fail because they are tick-box exercises designed to secure legitimacy for a decision that has already been taken or which will not be based on anything the participants in the consultation process suggest. The Power Commission really did come to this process without any firm views on the causes and solutions to the problem of disengagement. Their views emerged gradually out of what they heard both from experts, interested parties and the wider public. To take just one small example, the Commission vice-chair – Ferdinand Mount – came to the process an opponent of electoral reform and left a firm supporter because of the evidence he heard and saw. Power was not perfect but it was different and it certainly was much more than just another consultation exercise. The opinion-gathering and analysis was clearly terrific, as I sensed from the report. My question remains ... how did the recommendations for action (almost entirely about electorial reform) emerge from the analysis of the problem (much wider disaffection with, and mistrust of, the powers that be). If the recommendations were developed by a group of electoral reformers and then offered to testers and the rest of us it is, in my view, consultation. That is, information power-holders offer the rest a limited choice of options rather than a co-creation exercise. It's a pretty traditional way of doing things and doesn't in my view justify branding as Power to the People. I went to the 'Power to the People' conference yesterday (6th May). I came away broadly with the same opinion as this author. i.e. I was inspired by the findings of the report but it was also very obvious that nothing would come of it. For example, I attended the direct democracy breakout session. I could tell just by looking around the room that my fellow delegates weren't the types that would be looking for change. For example, there were a row of elderly women who cheered everything that Chris Huhne (the biggest critic of direct democracy) said, and there were a lot of suits everywhere. A number of the questions were of a single issue nature e.g. 1 guy spoke against Europe, another guy went on about his forum in Devon, Charter 88 were there to ask for support for their Sustainable Communities bill and Chris Huhne's consituent party (the old ladies) included 1 frail old dear who'd clearly lost her marbles. Do Turkeys vote for Christmas? Interestingly, the Tory MP who spoke, Douglas Carswell was promoting a very radical reform of parliament, and actually gave the impression that he wanted to give power to the people . He did admit he'd only been there a year, however. One wonders if he'll have the same agenda once he's been given a ministerial post. Saira Khan (she of the Apprentice) gave an interesting question to David Cameron about how he'd inspire ordinary people to vote, and Emma B (broadcaster) asked how we could trust him. DC didn't answer either question but I heard lots of approving comments from old ladies on the way out as to what a nice chap he was. I didn't go to the event on the 6th May. I was booked to go, but when I got the agenda I realised it was the same old tired formula of speakers and Q&A sessions. I thought (naively) that the conference designers may have been inspired during their inquiry to use different (more effective?) methods of engagement. They chose not to and alienated me and several of my peers.